Wonderfully indulgent, this genuine handmade Venetian Mask Ossessione is glamour on a stick. 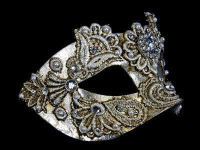 100% handmade, this Venetian luxury masquerade mask has been made with obsessive attention to detail. A myriad of intricate design characteristics - ornate macrame on antique white and the Swarovski crystals give you an exclusive party look for your masquerade ball or themed event. The Ossessione has been thoughtfully created on a handle which makes it easier to wear, especially if you are wearing glasses. 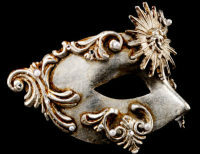 Inspired by the Baroque style of art and sculpture in the 16th and 17th centuries, the Ossessione comes to you from the artisan mask makers in Venice, the city that made the masquerade famous. Venice is the city of the annual Carnival which became popular in medieval times and, after a two century absence, was revived in the 1980s. Word of the revival spread and the Venice Carnival soon became the annual extravaganza it remains today. 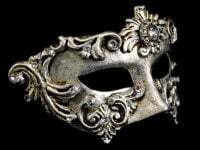 Today, Il Carnevale (the Carnival of Venice) represents an ancient culture of which the masquerade mask is its icon. These mask makers (Mascherari) strive to be as close to perfect as possible in their creativity of these exquisite masks. But this doesn’t mean that any two masks are the same - each one is unique, and an original work of art. The base of the mask has been modelled into shape using papier mache using the same techniques learnt and practiced centuries ago. A close look at the mask will reveal the fine layers of paper forming the papier mache and, here and there, a brush stroke of paint removing any doubt that the mask has been made by hand. And with the Ossessione comes a Certificate of Authenticity. Thanks to increasing popularity for real Venetian masks, artisans in workshops all over Venice now practice the craft they love. 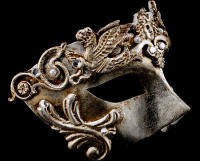 Every purchase of a genuine Venetian mask is keeping alive this ancient tradition. Enjoy wearing the Ossessione for your special occasion themed event and keep as your souvenir of a Venetian tradition, your own piece of Venice’s rich history. Order the distinctive Ossessione today and enjoy free delivery direct to your doorstep.